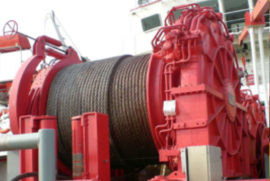 The anchorhandling / towing- winches are flexible configuration and be delivered both as single and double drum configuration. They are designed for high power constant tension operation with large rendering speeds. It can be delivered combined with chain gypsy. The pull capacity up to 500 tons pull. The units can be delivered with static and dynamic tension monitoring system. 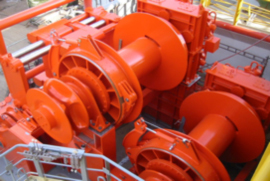 Winches can be delivered with our patented emergency release system for chain. 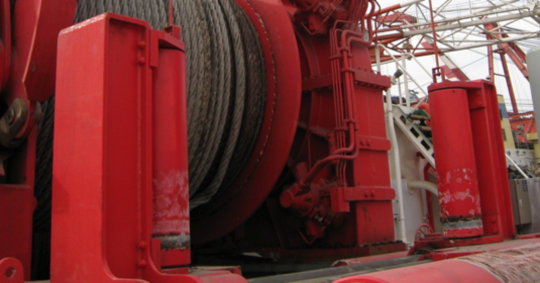 We deliver different types of spooling devices. These spooling devices are manually controlled , remote control or automatic control. The spooling devices can be delivered with automatic release at high side load. The automatic spooling system can spool a towing line with different size of cable.